Press CALCULATE after any change. 1. The collector and the tremie pipe is lowered together into the borehole. 2. Mix MuoviTerm with water according to specifications. 4. Start pumping MuoviTerm, through the tremie pipe to the bottom of the borehole. 5. 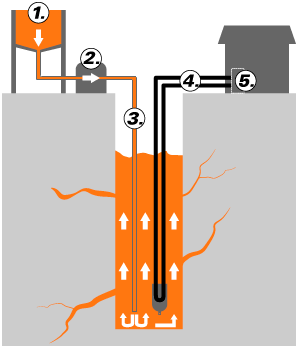 The borehole is filled from the bottom and up by pulling the tremie pipe upwards, while pumping MuoviTerm. 6. Maintain the pressure in the collector for at least 6 hours, until MuoviTerm has hardened.